I will highly recommend dental land pediatric because my kids love their Dr and the services every time they visit. Beautifuland clean environment and wonderful reception. I will give them 5 stars! I will highly recommend dental land pediatric because my kids love their Dr and the services every time they visit. Beautiful and clean environment and wonderful reception. I willgive them 5 stars! The practice is amazing! Beautiful, clean and lots of distractions for kids. The doctor is very friendly and patient. Shetakes her time to explain issues and has a very sweet bedside manner. About the best you can ask for in a pediatric dentist! The practice is amazing! Beautiful, clean and lots of distractions for kids. The doctor is very friendly and patient. She takes her time to explain issues and has a very sweetbedside manner. About the best you can ask for in a pediatric dentist! We had a terrible experience at Dental Land with my 4 year old and almost 2 year old. The office is great, very kid friendly and both my children were happy to be there. The office was empty except for theperson at the front desk and the dentist but no one greeted us, they just ushered us back. I explained that this was the toddler's first time and we’ve tried a couple of warm up visits with my 4 year old over the last two years but wanted to do the actually first cleaning at a pediatric office. The dentist never introduced herself or interacted at all with the kids. She was very cold, just asked for medical history then put on the mask and glasses and told me to restrain my 4 year old and place his head on her lap. She said I would need to hold him down. He heard this and panicked. I told her I would prefer some warm up or engagement from her first so he could understand what she was going to do, the tools she was going to use, etc. She said she would engage with him when he was laying on her lap and she was able to look in his mouth. Long story short, I tried to lay him down and he went nuts, kicking and screaming. She told me as a parent he has to listen to me and I have to restrain him. I told her again that some level of interaction or explanation or anything from her would make it easier and she ended up repeating several times that children should do as they are told and if they don’t listen to the parent, why would they listen to her-a stranger. I was infuriated that she kept insinuating I was being an indulgent parent and that the issue was discipline. I explained that I want my children to have positive experiences with the dentist and unless it’s an emergency or gently holding their hands down (for shots, other necessary procedures), I’m not going to force them into a stranger’s lap and restrain them. There has to be some warm up to get kids comfortable. I ended up telling her that this approach won’t work for us and we clearly have different philosophies on interacting with children. We left. I very rarely post reviews but this experience had me all sorts of angry because my kids are even more afraid of the dentist now. It is my opinion that Dr. Abioro should not be working with young children. She was great with my son! Fast and thorough. Friendly staff, child friendly environment. My daughter left with a great experience! Great location. Nice, clean and beautifully decorated office. Great and knowledgeable dentist. Highly recommend. She is very kind and patient with my children! Office is very clean, friendly staff and fun atmosphere. My daughters absolutely adore Dr. Dinah and her assistant; they're all bestfriends. Super cute office, and Dr. Dinah is amazing! Excellent service, prompt and personable. This place is magical. I was apprehensive about my toddler's first dental visit and I realized very quickly that I had nothing to be nervous about. Everyone was incredibly professional. The office is inviting, pristine, and perfectly suitedfor children. My son's cleaning was done with patience and precision and he left with a giant smile on his face. I am appreciative to Dr. Abioro for a wonderful experience and look forward to my son's next appointment. I highly recommend, as soon as you walk through the door it caters to your children. From the activities in the waiting room, to the over head televisions that keep your children’s attention while they are being seen. Ms. Abioro wasso kind and coached my 16 month old through the entire cleaning!!! As always it’s a pleasure having visits to this office. Everything is always 5 stars and better. We love Dr. Abioro! She was very warm and patient with my toddler who screamed her head off. She was great, hopefully things will go better in 6 months. This was my LOs first dental visit at 18 months. He had a great time in the waiting/play room. Even enjoyed taking his “first visit picture”. But when it was time for his cleaning he screamed like nobody’s business. Dr. Abiorowas amazing, patient, calm, and sweet. We will definitely be back. I am AMAZED at this practice. The staff at the front desk were kind and very personable. The dentist was equally as amazing. The office itself was SO well done and so kid friendly. I was seriously amazed...I don't think Ihave ever been to a pediatric office that is that well done. Thanks! Been seeing her since she opened. Great clean, fun, friendly facility with great people to match. Service is stellar. Gives the children a lot of options and takeaways. Starting to feel like family. She is an excellent professional. My daughter loves going to the dentist thanks to how the doctor treats her. My daughter's first dental visit was a great success ! She wasn't scared and felt very comfortable ! Will be back again ! We are new to this dental practice. So far so good. Dr. Abioro is personable and explains procedures in detail. Dr Abioro has been so patient with my child who was very nervous about some procedures...its not always easy or quick but she helps the process along until we succeed. Thanks for everything. Dr Dinah was extremely patient and very welcoming for my children. I was extremely impressed by the office ambiance and all of the staff. You can tell that they thought of absolutely everything they could to ensure that children felt comfortable during their procedures. Dr Dinah was great! Dr.Abioro is always thorough and pleasant. Our children love her office set up and always are excited to get the prize at the end. Very easy to schedule an appointment and appreciate the reminder notifications. Always on time and excellent with kids! My daughter's appointment with Dr. Abioro was great! My daughter immediately got in the dental chair and was ready for her check up and cleaning. No anxiety. Dr. Abioro is really great with kids. My daughter who is 7, LOVES Dr. Dinah, and I do too. Her office is bright, cheerful, colorful and decorated like a dental candy land. My daughter is always excited to go to the dentist and there is barely ever anywait time. Dr. Dinah accommodates my daughter so well, I NEVER have any worries when we go. She answers every question with professionalism and care, and she makes sure my daughter is comfortable and happy the entire time. She talks to my daughter, gives her stickers, tokens, toys...everything that kids love. My favorite part is the office environment in general; it's always clean and fresh and her staff is amazing. If I ever move to another location in MD, I would drive over 50 miles to keep my daughter this happy. I wish she did adults, because we just love her. I love Dr Abioro and her staff! They are all so professional and polite! My kids love coming here and they love Dr Abioro! If my kids enjoy coming here then I'm a happy mom! This office was amazing the doctor and staff were great! The office is extremely kid friendly and had coffee maker and cold water for adults. My daughter didn't want to leave! I have already made her next appointment! Dr. Abioro is so wonderful. We had an appointment to extract my son's tooth and frankly, I was more nervous than my son; this was his first time using laughing gas and it was a bit daunting for me. She didan excellent job of preparing us both and the entire visit went off very well- there was a needle and of course discomfort with the insertion of the anesthesia but that is to be expected. The facility is extremely clean and well kept and the staff is professional and courteous. We were attended to immediately (we had a 9am appointment), but for our previous appointment probably had a 15 minute wait (we were welcomed immediately by staff) and that was at 3pm on a weekday. 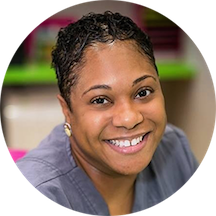 Overall, I highly recommend Dr. Abioro- her bedside manner is soothing and perfect for children and parents alike- and her expertise is evident from the get-go. Awesome!! Beautiful and clean office. Very inviting to children. Dr. Abioro was very nice and professional. Importantly, she explained what she was doing to my son in a way that was kid-friendly. Not only was my 5 yr. old grandson totally pleased, but grandma & granddaddy enjoyed the visit also! Beautiful office!!!! My visit was great. I was so nervous about my daughter appt. Ms Abioro did awesome in comforting my daughter and talking with her through out her procedure. Also the receptionist was great . She answered my questions also very welcoming.Great team. I already starting referring people. Thank you guys so much. My 4 year old son and I love Dr. Abioro. My son has no fear of the dentist due to the fun kid-friendly office and Dr. Abioro. He actually gets excited when it is time for a dentist appointment. The waitingroom is full of educational toys and kid friendly furniture. The décor is top notch even down to the safari themed bathroom. Each appointment starts with your child picking out fun goggles to wear and a flavor menu for the treatments. Bonus points for the tv on the ceiling to distract your child while Dr. Abioro goes to work. Each visit ends with a prize form the tooth-chest and a goody bag. I couldn't ask for a better experience. Dr Abioro was very detailed in explaining my son's state of health. Dr. Arbioro and staff are just excellent. They are very clean and professional making it a wonderful experience. We thank you so much for being the best at what you do! ?? This was my daughter''s second visit with Dr. Abioro and just as our 1st appointment, everything went very well. Dr. Abioro has a gift of calming the anxiety of patients and establishing a trusting relationship. My daughter is an anxious patientand I am impressed by how Dr. Abioro was able to keep her calm and complete the procedure in a timely fashion. So happy I found her office. I highly recommend her. Dinah Abioro is a very gentle, caring and professional dentist. She handles children very well and makes them feel comfortable enough to go to the dentist. She allows you to ask questions and gives feedback for the visit as well astreatment plans and to top it all off, her dentist office is very kid friendly, Immaculate, and welcoming. It smells that too. I love it for my kids. Dr. Abioro was fantastic with my son (and me!) when he needed his first dental work. We had a bad experience at another pediatric dentist, so I was very concerned. On top of that, he is deathly afraid of needles. Somehow,he never even realized he got one! She was quick, reassuring, and very sweet. Our fear of the dentist is GONE! Staff was professional and courteous as well. I finally found a dental Office for my children that I could call home! I love everything about her office. VERY child friendly, VERY clean and VERY professional. I have nothing bad to say. Highly recommended office! My daughters and I always have a pleasant experience with DR. Abioro, I wish she took adults. I will never take my girls anywhere else!!! Wouldn't go anywhere else for dental care for my four children. Absolutely adore Dr. Abioro and her staff! Great bedside manner! The office was clean and attractive. The doctor was very welcoming.